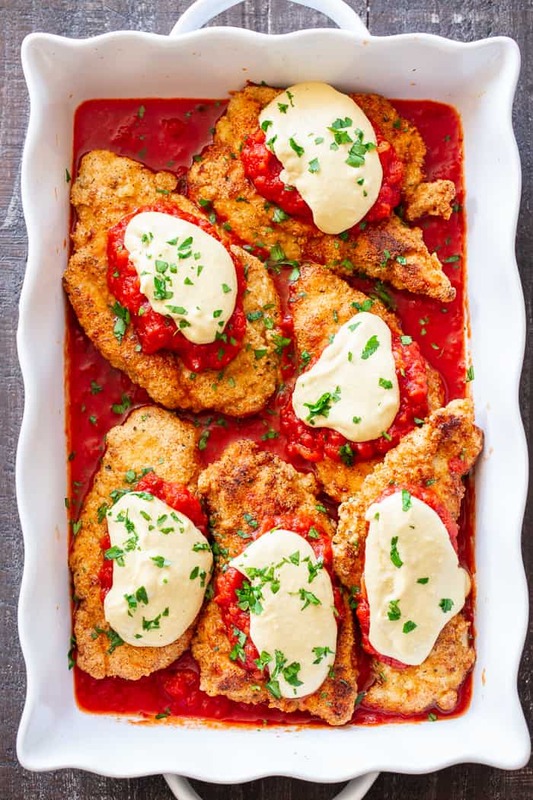 This dairy-free and Paleo Chicken Parmesan has all the flavors of the real deal! 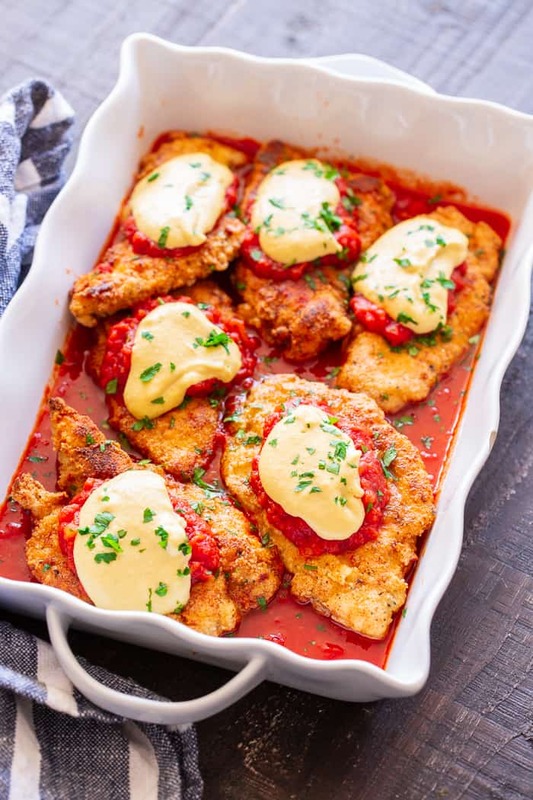 Crisp “breaded” chicken cutlets are layered with marinara and a flavor-packed cashew “cheese” sauce that’s perfect for any special dinner. Gluten-free, no sugar added, dairy-free. I was so excited when I discovered a “cheese” sauce that LEGIT tastes like cheese after making my roasted garlic pizza. Groundbreaking stuff! Especially because it’s seriously the easiest thing to throw together in a blender. 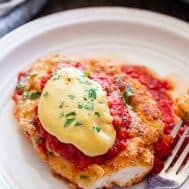 I knew I had to use it (or a variation) for new recipes and I had a paleo version of chicken parmesan on the brain for awhile. Well, last week I went for it and the final product was probably even better than I predicted! 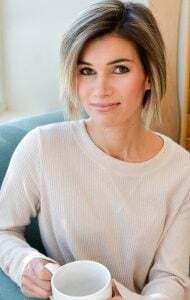 It’s totally family friendly (and trust me – I have a PICKY family!) and not a bite went to waste. 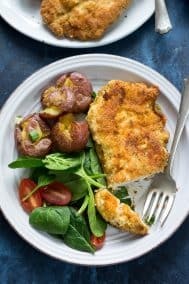 I started out with a variation on my original chicken cutlets. 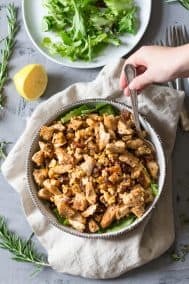 After experimenting with the crispy chicken from this salad, I decided to eliminate the coconut flour to simplify the recipe. I also prefer the flavor of the “breading” sans coconut flour, although the difference is small. The cutlets are dredged in egg and a seasoned almond flour/tapioca mixture, then fried in coconut oil. I recommend either buying thin-sliced chicken breasts OR pounding them to about 1/2″ thickness. I have a pet peeve when it comes to thick chicken cutlets! Thinner also means they’ll fry perfectly. The rest of the recipe is basically no work at all. 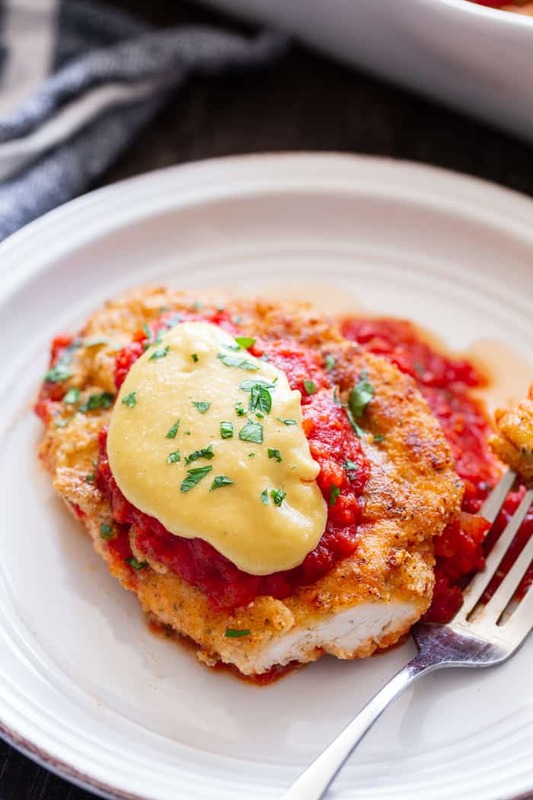 The cheese sauce can be blended up either before or after frying the cutlets. I used a Nutribullet and didn’t even need to soak the cashews – the sauce blended it under a minute. 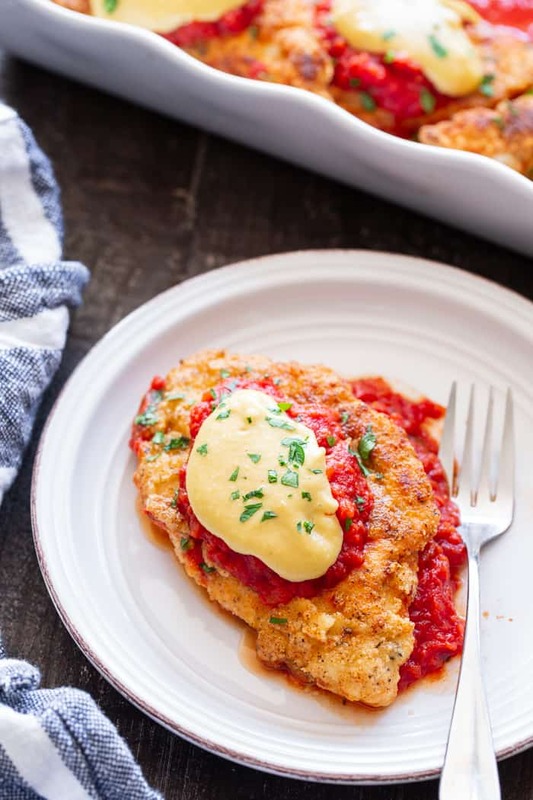 While the sauce has a cheesy flavor, the consistency is creamy, not stretchy like the mozzarella cheese in traditional chicken parmesan. I honestly don’t care and love the creaminess along with the marinara sauce! As for the marinara, you can use any you like. I have two favorites that contain no sugar or other additives – Rao’s and Cucina Antica. Both I believe you can find at most of your local grocery stores. Since you’re not actually melting the cheese here, you won’t need to bake for long – just to heat everything through. 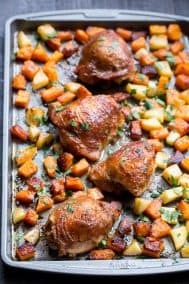 To avoid baking altogether, you could heat your sauce separately, however, I tend to find that to be more work than simply throwing the whole dish in the oven for 10 minutes! The result, creamy, cheesy, chicken parm flavor with no dairy at all, no added sugar, no gluten or grains. 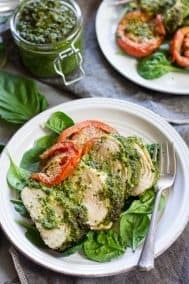 It’s perfect to serve over zucchini noodles, sweet potato noodles, or spaghetti squash to make a full meal, packed with veggies, protein, good fats, and flavor! I hope you’re ready for a savory, healthy treat that you won’t believe is dairy-free! Grab your blender and a big skillet and let’s go! 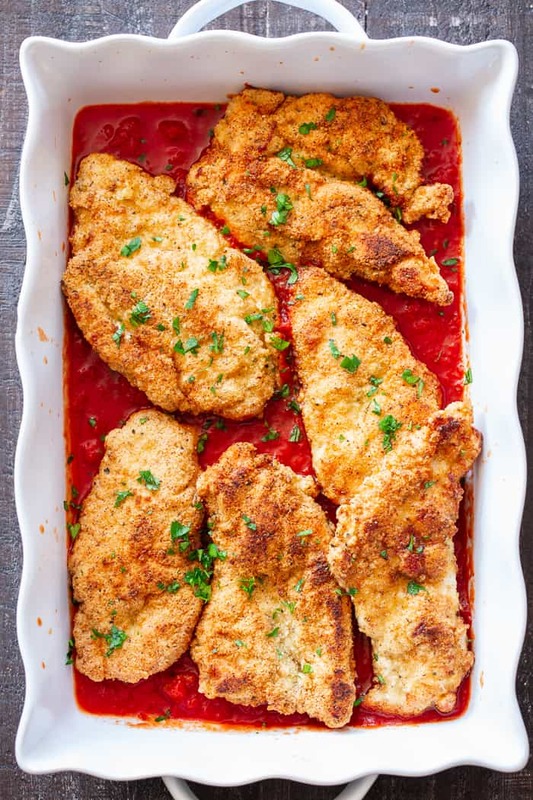 This dairy-free and Paleo Chicken Parmesan has all the flavors of the real deal! 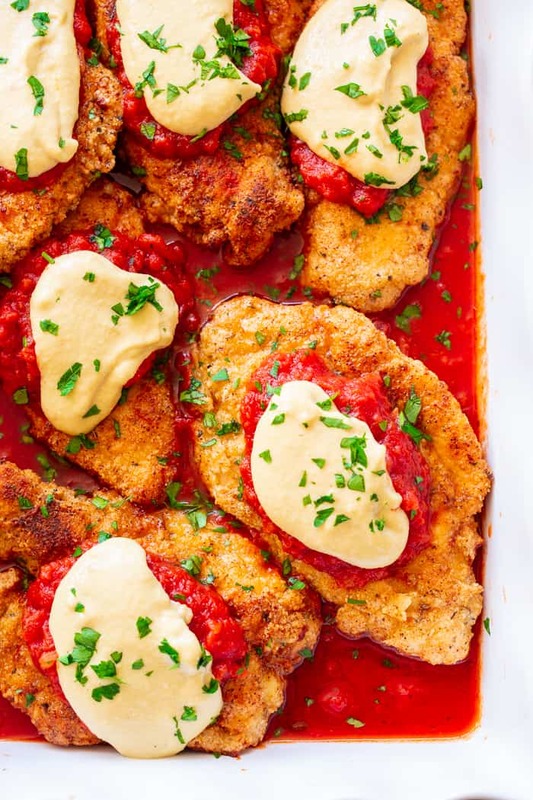 Crisp “breaded” chicken cutlets are layered with marinara and a flavor-packed cashew “cheese” sauce that’s perfect for any special dinner. 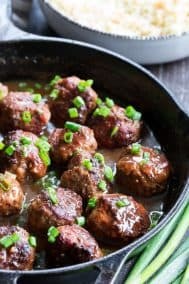 Gluten-free, no sugar added, dairy-free, and keto friendly. 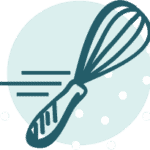 Place all ingredients in a small high speed blender or food processor. I used my NutriBullet for this and it was fast and easy. Blend on high speed until smooth and creamy, transfer to a small bowl if desired and set aside. Mix all the dry ingredients in a medium shallow bowl (you will dredge the cutlets in the mixture). 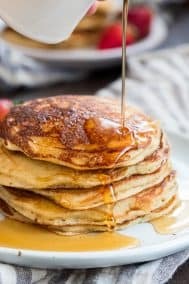 Preheat your oven to 400 degrees F.
Have your whisked egg in a shallow bowl and heat a large, deep skillet over medium heat and add the coconut oil Depending on the size of your skillet, you might have to fry these in 2 batches, so have additional cooking fat ready in case you need more. Once the skillet it preheated (you can see if a drop of the dry mixture sizzles), dip one cutlet in the egg, shaking off excess, then coat in the dry mixture, shaking off excess. Place the chicken in the pan, then repeat the process for each piece of chicken. 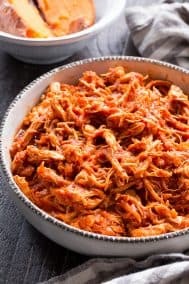 Cook on one side until medium-golden brown (2 minutes) and crisp, then carefully turn over the chicken with tongs and cook the second side until golden brown and juices run clear, about 2 minutes depending on the thickness of your chicken. Bake in the preheated oven for 5-10 mins or until just heated through. This is only to heat through, so do not keep it in the oven too long. Serve right away alone or over cooked spaghetti squash, sweet potato noodles, or zoodles. Enjoy! 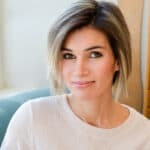 I can’t do dairy and my husband is allergic to cashews, is there a good substitute for the cashews? This looks super yummy! I run into the same issues with “cheesecake” recipes too. 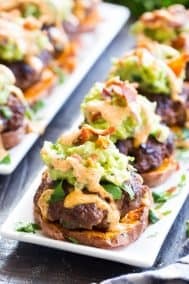 These recipe looks great but I am also allergic to cashews, would walnuts be a good alternative for the cashews? Michelle, this cheese is delicious! I am definitely making a second batch tonight. Thank you so much for this recipe. 😁 I have really been missing cheese; I have some other cashew cheese recipes, but this is my favorite. The recipe is delicious. I will definitely make it again. I have extra “cheese” sauce. How long will it keep and what suggestions do you have for using it. I made this recipe for the guys at the firehouse last night and they all loved it. Best thing about it, we all felt great afterwards, not full and weighed down liked traditional chicken parm. I will definitely be sharing. Thank you so much!